Prince of Penzance winning the race. 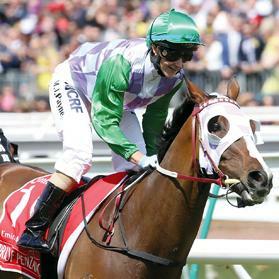 Michelle Payne became the first female jockey to win the A$6.2 million ($4.44 million) Melbourne Cup yesterday as she rode rank outsider Prince of Penzance to a famous victory in Australia’s richest and most prestigious race. Jumping from barrier one, Payne bided her time until well into the final straight before pushing the 100-1 shot clear at the 200-metre mark and held off a charging Max Dynamite by three-quarters of a length. Local stayer Criterion crossed the line third in the gruelling 3,200 metre handicap at Flemington racecourse in front of a bumper crowd of 100,000 bathed in late spring sunshine. Originally passed over at a yearling sale in New Zealand, Prince of Penzance was secured for $36,000 and brought to Australia to be prepared by local trainer Darren Weir. The six-year-old gelding became only the fourth 100-1 chance to win the Melbourne Cup in its 155th running. Thirty-year-old Payne felt the win was pre-ordained. “I actually really had a strong feeling I was going to win but I thought ‘ah, don’t be stupid, it’s the Melbourne Cup’,” Payne, the youngest of 10 children raised on a farm in rural Victoria state, said in a trackside interview. Celebrity Italian jockey Frankie Dettori, who rode Irish-trained Max Dynamite, was later charged with careless riding in the final straight and promptly suspended for a month with a fine of A$20,000. It was a disappointing day for many of the foreign-trained horses, transported across the world at huge expense. Japanese favourite Fame Game finished 13th, while Sky Hunter, prepared by the powerful Godolphin stable, was 22nd in the 24-entrant field. Prince of Penzance’s win was a triumph for the Payne family, with Michelle’s brother Steven, who has Down Syndrome, the six-year-old gelding’s strapper.